Posted March 23, 2006 by grohling & filed under Uncategorized. At the morning session, our Blue Badge Guide, Geoff Marshall, put the history of computing into the context of the history of science and technology. He made it very real for us by telling us something about the personalities involved. The fundamental science of Newton led to a primitive but useful steam pump built by a blacksmith. A later development, now pressurised, powered 1,700 looms in a cotton mill. 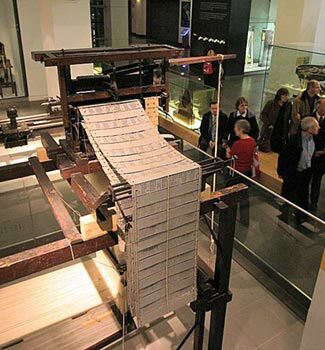 We saw a loom controlled by punched cards, an idea adapted to program early computers. We think of the speed of change being particular to our era but the difference between the Puffing Billy and the 1868 locomotive is less than a decade but a vast difference in design, style, reliability and implementation of the technology. There is a similar story comparing the Pegasus built in the mid 1950s, one of the first commercial computers based on the Turing architecture, with its valves and trailing wires and the tight wiring complexity of the Cray computer from the early 1970s. The faster Cray concept recognised the speed of light as being a limitation on speed, so shorter connections greater speed. Our visit was too brief and we missed the firing up of Pegasus which takes place on Thursday afternoons. There are a couple of photographs here as a reminder of some of the fascinating exhibits we saw, or for others to see something of what they missed. We can let you have contact details for our guide Geoff Marshall and the other tours which he runs. Our afternoon visit to the archive at Blythe House was also a time constraint torture. Our Curator of Computing, Tilly Blyth, was assisted by the Curator of Communications, John Liffen, on our tour. We went through the Communications Archive to reach the Computing Archive and John gave us a brief tour of this too. We saw the BBC’s first radio transmitter, the 2L0, which was superseded within four years. We didn’t dare ask too many questions in case we didn’t get to Tilly’s patch. In the Computing Archive we saw the first laptop that would break your lap not alone your back which had a screen about twice the size of one on a mobile phone today. Again put into context by Tilly’s story of the people involved. The inventor of this laptop was better at inventions than at marketing and blabbed about the better model in the pipeline so no one bought the first, he went bust. The story we learned in the morning continued, useful early machines that did real work: that could store information, process conditional statements and input and output, were then quickly refined and improved. Tilly set us a tease, she pointed to something that looked like a bath towel rail for us to guess what it was. It was a small delay line and was similar to storage used in ‘Leo’ the famous J Lyons & Co.’s computer. Convergence was also a theme of the day; we are not just building on past achievements in computer technology but basing advancements on the the different materials and techniques that become available. This was a well titled tour ‘From Valves to Chips’. 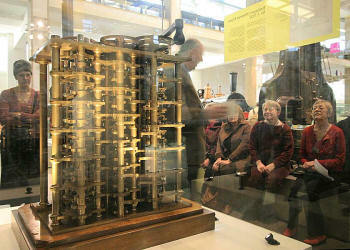 The photos from the Science Museum showing Babbage’s Difference Engine and the Jacquard loom are reproduced by kind permission of Keith Diment. For more pictures visit Photo Album Number 36 at www.diment.org.uk. Photos could not be taken at Blythe House as it is not suitable on a tour such as ours but arrangements can be made for anyone wishing to do some research.